Jinnah proclaimed 16 August 1946, Direct Action Day, with the stated goal of highlighting, peacefully, the demand for a Muslim homeland in British India. However, on the morning of the 16th armed Muslim gangs gathered at the Ochterlony Monument in Calcutta to hear Huseyn Shaheed Suhrawardy, the League's Chief Minister of Bengal, who, in the words of historian Yasmin Khan, "if he did not explicitly incite violence certainly gave the crowd the impression that they could act with impunity, that neither the police nor the military would be called out and that the ministry would turn a blind eye to any action they unleashed in the city." That very evening, in Calcutta, Hindus were attacked by returning Muslim celebrants, who carried pamphlets distributed earlier showing a clear connection between violence and the demand for Pakistan, and implicating the celebration of Direct Action day directly with the outbreak of the cycle of violence that would be later called the "Great Calcutta Killing of August 1946". The next day, Hindus struck back and the violence continued for three days in which approximately 4,000 people died (according to official accounts), Hindus and Muslims in equal numbers. Although India had had outbreaks of religious violence between Hindus and Muslims before, the Calcutta killings was the first to display elements of "ethnic cleansing," in modern parlance. Violence was not confined to the public sphere, but homes were entered, destroyed, and women and children attacked. Although the Government of India and the Congress were both shaken by the course of events, in September, a Congress-led interim government was installed, with Jawaharlal Nehru as united India's prime minister. The communal violence spread to Bihar (where Muslims were attacked by Hindus), to Noakhali in Bengal (where Hindus were targeted by Muslims), in Garhmukteshwar in the United Provinces (where Muslims were attacked by Hindus), and on to Rawalpindi in March 1947 in which Hindus were attacked or driven out by Muslims. Late in 1946, the Labour government in Britain, its exchequer exhausted by the recently concluded World War II, decided to end British rule of India, and in early 1947 Britain announced its intention of transferring power no later than June 1948. However, with the British army unprepared for the potential for increased violence, the new viceroy, Louis Mountbatten, advanced the date for the transfer of power, allowing less than six months for a mutually agreed plan for independence. In June 1947, the nationalist leaders, including Nehru and Abul Kalam Azad on behalf of the Congress, Jinnah representing the Muslim League, B. R. Ambedkar representing the Untouchable community, and Master Tara Singh representing the Sikhs, agreed to a partition of the country along religious lines in stark opposition to Gandhi's views. 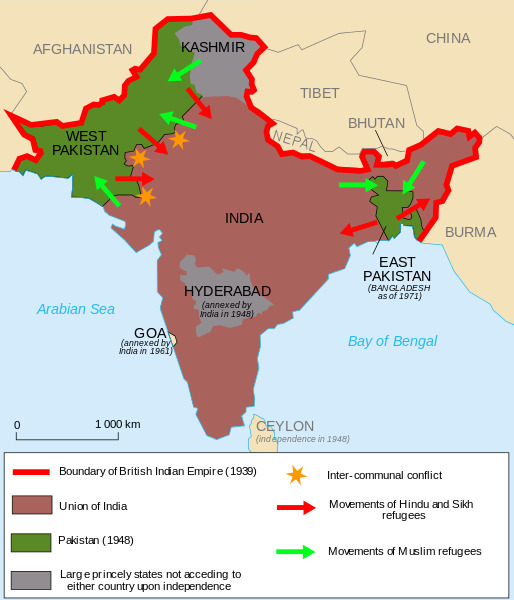 The predominantly Hindu and Sikh areas were assigned to the new India and predominantly Muslim areas to the new nation of Pakistan; the plan included a partition of the Muslim-majority provinces of Punjab and Bengal. The communal violence that accompanied the announcement of the Radcliffe Line, the line of partition, was even more horrific. Author's Note Starts: Radcliffe Line, The line of Partition where Kashmir is a place ruled by "Large princely states not acceding to either country upon independence. Similar is the status of Hyderabad which is quite stable state now in India. Psychology behind India-Pak war: Pakistan continues to fight for occupation of Kashmir into the Pakistan. The princely states by now are largely dissolved and the Indian forces were responsible for the security of Kashmir. The history is the proof that Pakistan never stayed back from encroaching more land which shows insatiable appetite of this country and response towards India. Not only Kashmir, Pakistan tried to occupy the Rann of Kutch in Gujarat. This was predominately not only an issue of land grabbing and on minor front a Muslim issue but also the demonstration of power and rebuke over the authority of neighboring nation. Post independence, the emotions of discrimination, anger and vengeance have not died which lead to more wars among two nations, in all of which India never tried to occupy any land on the Pakistan side. The Indo-Pakistani War of 1971 was the direct military confrontation between India and Pakistan during the Bangladesh Liberation War in 1971. Indian, Bangladeshi and international sources consider the beginning of the war to have been Operation Chengiz Khan, when Pakistan launched pre-emptive air strikes on 11 Indian airbases on 3 December 1971, leading to India's entry into the war of independence in East Pakistan on the side of Bangladeshi nationalist forces, and the commencement of hostilities with West Pakistan. Lasting just 13 days, it is considered to be one of the shortest wars in history. During the course of the war, Indian and Pakistani forces clashed on the eastern and western fronts. The war effectively came to an end after the Eastern Command of the Pakistani Armed Forces signed the Instrument of Surrender, on 16 December 1971 in Dhaka, marking the liberation of the new nation of Bangladesh. East Pakistan had officially seceded from Pakistan on 26 March 1971. The 1974 Indira–Sheikh accord between Kashmiri politician Sheikh Abdullah and Indian Prime Minister Indira Gandhi allowed the former to become Chief Minister of Jammu and Kashmir again after 11 years. The State of Jammu and Kashmir which is a constituent unit of the Union of India, shall, in its relation with the Union, continue to be governed by Article 370 of the Constitution of India. The residuary powers of legislation shall remain with the State; however, Parliament will continue to have power to make laws relating to the prevention of activities directed towards disclaiming, questioning or disrupting the sovereignty and territorial integrity of India or bringing about cession of a part of the territory of India or secession of a part of the territory of India from the Union or causing insult to the Indian National Flag, the Indian National Anthem and the Constitution. With the emergence of terrorism in Pakistan and internationally, Pakistan starts to interfere in the internal affairs of India. Many Kashmiri politicians were still asking for autonomy for Kashmir much against the Indira–Sheikh accord. Pakistan fails to see that even if some Kashmiri politicians have issues over autonomy, this issue is largely of India and Kashmir and can only be overseen by a competent international authority such as UN. Pakistan as such cannot interfere in the internal matters of India or any country. Terrorism has its roots in the religion because of which Taliban and other fronts take interest in Indian Muslims however, this is quite a delineation for their cause (which is largely unclear to me but still Pakistan being a separate and independent Muslim nation gives enough idea about their basic theory behind conflicts, both governance and terrorism). Due to this accord, India has played vast role in structuring Kashmir, Indian Muslims form their separate yet different identity in modern world. The Kargil War (Hindi: करगिल युद्ध kārgil yuddh, Urdu: کرگل جنگ ‎ kārgil jang), also known as the Kargil conflict, was an armed conflict between India and Pakistan that took place between May and July 1999 in the Kargil district of Kashmir and elsewhere along the Line of Control (LOC). The conflict is also referred to as Operation Vijay (Victory in Hindi) which was the name of the Indian operation to clear the Kargil sector. The cause of the war was the infiltration of Pakistani soldiers and Kashmiri militants into positions on the Indian side of the LOC, which serves as the de facto border between the two states. During the initial stages of the war, Pakistan blamed the fighting entirely on independent Kashmiri insurgents, but documents left behind by casualties and later statements by Pakistan's Prime Minister and Chief of Army Staff showed involvement of Pakistani paramilitary forces, led by General Ashraf Rashid. The Indian Army, later on supported by the Indian Air Force, recaptured a majority of the positions on the Indian side of the LOC infiltrated by the Pakistani troops and militants. With international diplomatic opposition, the Pakistani forces withdrew from the remaining Indian positions along the LOC. Due to militancy, Kashmiris are unable to take part in the process of democracy whole heartedly. Most of the days because of terror strikes and discords between Pakistan and India, the trade and general life remains dull and threatened. The development is however, continued in the state but as compared to rest of India, the State's overall performance is highly poor and is a matter of concern. It is important in lieu of dense efforts put by Indian government and the incapability of Kashmiris to properly represent themselves, the Kashmir politicians who still argues for an autonomy for Kashmir should be tried under criminal laws pertaining to sovereignty of a nation. Kashmir has undergone tremendous changes since 1947. Retaining the matter only to the exercise of vote is now highly unjustified. There should be moral grounds on which the state should be completely recognized as part of India. United Nations should not overlook the fact of stumbles to development due to undue impact of militancy and irresponsible behavior of Pakistan. It is important to consider the history which can lend insight how to see the whole picture related to Kashmir. Pakistan should be forbidden to interfere in this matter and be resolved to solve militancy on their level. India should take responsibility to handle terrorism on their front as fresh threat and if Pakistan is involved with the terrorism then conclusively. Only Pakistan should not interfere but more importantly in accordance with Tashkent Declaration should move back to pre-conflict position till and on February 25, 1966. This will also solve the LOC issue between the two nations. Terrorism has another facet when it comes to Taliban and even its Indian equivalent. They have history of conflicting ideologies and use of violence to get their point across. In lack of proper dialogue, no one is able to see in right direction and bring out results. If Pakistan resolves not to interfere, taliban and other terrorist organizations remain only restricted to solve shallow issues that will greatly harm their principle ideology and impact. Any violent organization survives on its scope of spreading fear or terror that too for the issues of importance. There are two benefits of Kashmir resolutions before us. Indian government should work to exclude Pakistan and include Kashmir in its territory at the earliest. Hope the development plans for the state will also be at priority because we want to level Jammu and Kashmir with rest of our country.